LONDON, UK, 2018-Sep-14 — /Travel PR News/ — A former janitor’s house, which had lain empty and derelict for seven years, has undergone a six-figure refurbishment and is now providing much needed community space in a Renfrewshire town, thanks partly to British Airways. The building, which provides after school care and is operated by the social enterprise KLAS Care, has become the hub for a growing number of community groups in the East Fulton area of Linwood. Lesley Compston, who started KLAS Care in 2010 with another Linwood mum, Kirsty McKenzie, to tackle the chronic shortage of affordable after school care in the area, Hraised £300,000 from public and private sector sources to complete the project, which is housed in the former janitor’s house in the grounds of East Fulton Primary School, Linwood. The installation of the building’s energy efficient lighting, heating, hot water system and highly rated insulation was made possible by a £12,000 funding package from the British Airways Carbon Fund, which allows the airline’s customers to make a donation to low carbon community initiatives throughout the UK when they purchase flights online. The money from the fund is then passed by British Airways to UK Charity Pure Leapfrog for allocation to community-based projects throughout the UK and Africa. A further donation of £5,000 from the British Airways Carbon Fund in the next funding round will see the installation of solar panels on the building, further reducing energy costs and helping the social enterprise initiative become even more financially viable, benefitting the community as a whole. KLAS Care worked closely with Renfrewshire Local Energy Action Plan (LEAP), an energy charity that helps residents and community-based organisations to save energy, and money, by providing free, impartial advice on a range of matters, including heating and insulation. 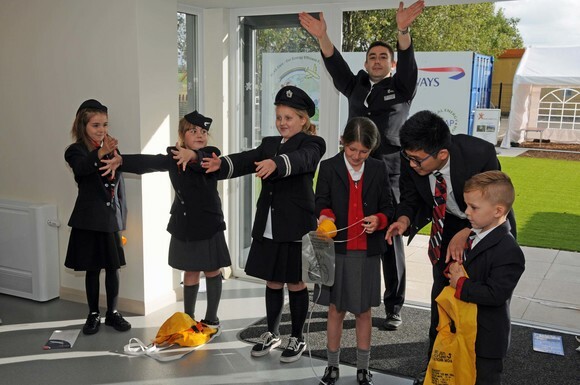 LEAP was instrumental in securing the financial contribution from the British Airways Carbon Fund. The East Fulton project is the first in Scotland to benefit from funding from the British Airways Carbon Fund. “Not only will the new facility enable KLAS Care to significantly expand affordable child care in the area, the main purpose of our social enterprise efforts, but it has already become a focus for community activity, from parent groups to cycling initiatives and other activities involving members of the community from the youngest to the oldest. Lesley added, “The new facility is really is an example of the saying ‘build it and they will come’”. Adele Fraser, Chief Executive of Linstone Housing Association, who will formally open the new premises, said: “I am honoured to be asked to formally open this wonderful new facility. British Airways gives all customer donations to the BA Carbon Trust Fund to Pure Leapfrog (Registered Charity Number 1112249). Pure Leapfrog actively seeks out community-based projects across the UK and in Africa providing low carbon technologies such as solar panels, small wind turbines, energy efficient lighting and heating and insulation. This entry was posted in Airlines, Travel, Travel & Environment, Travel & Kids, Travel Services, Travelers and tagged Adele Fraser, British Airways, Carbon Fund, house, janitor, Lesley Compston, refurbishment, Renfrewshire town. Bookmark the permalink.